ONE can almost feel sorry for Ferrari. They have done more or less everything right this year and in Austria the team did everything - and at the same time got it all horribly wrong. And yet it is hard to blame them for doing it. Michael Schumacher won the race by a few feet from Rubens Barrichello but it was the number two who was the number one all weekend. Rubens was on pole and led all the way. In the final laps Ferrari radioed Rubens and told him the bad news that he must move over for Michael. Michael is the World Championship challenger and one day later in the summer he might need the four extra points that he gained. It is unlikely given his current position but it is always possible. But Ferrari completely misjudged the mood. Michael Schumacher was boo-ed and whistled so much by the Austrian fans that he contrived to put Rubens on the top step of the podium. Scurrying away from the podium Michael was boo-ed in the Press Office... and probably out across the world the fans boo-ed in their houses and in the bars and pubs where they gather to watch racing. After the race Michael felt the need to say that it was not his fault that he had won. He had been told to do so and he had not had much time to think about it. But Jean Todt mentioned in a media scrum that the drivers had been told on lap 63 of 71 which seemed to suggest that Michael had more than "a few meters" to decide to win. They were having trouble getting their story right but it did not really matter why or when the decision had occurred. The key issue was the reaction to it - and it was quite startling. The world does not want to see "fixed" races. But Todt and Ross Brawn did not break any rules. And what they did was for the good of Ferrari. It is better to have points in the bag and, if by some wild and silly fluke Michael ended up losing the title by four points they would be crucified as fools. One can blame the rules if you wish but those of us who object to team orders are arguing against tradition and at the same time in favor of show business rather than sport. Some would say it is not sporting that Rubens moved over to let Michael go ahead but in fact it was a move which highlighted Ferrari's attitude that sport is war and war must be fought effectively... Letting Rubens win would have kept the crowd happy but would not have been good business. But when all is said and done and all the arguments are put forward what we saw was a situation in which the actions did not feel right - although nothing can be done to stop it happening. If you ban team orders, the teams will simply employ subterfuge to achieve the aim they wish to achieve. You cannot legislate against that. And so the only reaction must be positive. The sport will be back on the front pages again. The viewing figures will go up because of the controversy. But at least none of the journalists will be writing about the sport being boring. The "scandals" of Austria obscured too very important points: Michael Schumacher was beaten fairly and squarely by Rubens Barrichello; and Ferrari's dominant win was nowhere near as dominant as it looked. The Williams-BMWs were on a one-stop strategy and Ferrari was on a two-stop strategy. 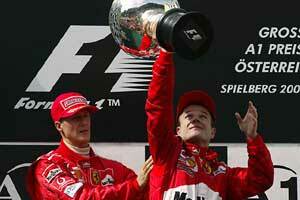 At the end of the race the two Ferraris were 18 seconds ahead of the two Williamses. It looked like a crushing defeat but one must not overlook the fact that the two periods when the race was run behind the Safety Car cost the Williams-BMWs more time than it did the Ferrari men. How much time did it cost? Was it 10 seconds? Was it 15 seconds? If the race had gone without interruption the Williams duo would have been very close to Ferrari at the end. They might even have been ahead. The first Safety Car was caused by the demise of Olivier Panis's BAR-Honda which blew its engine in dramatic fashion on lap 23. This caused the car to spin down the main straight, fortunately without hitting a wall. The car came to rest in the middle of the road, a highly dangerous situation. The car was tidied away and the race restarted and as the field headed up towards the second corner, Alex Yoong (who was a lap down) locked up his brakes in rather spectacular fashion. Behind him David Coulthard and Nick Heidfeld were side by side. "I saw a cloud of tire smoke as Yoong braked really hard and early ahead of us," said Heidfeld. "Maybe I pressed the pedal too hard while the brakes were still too cool. The car got away from me and next thing I knew I was going backwards down the grass." The Sauber missed Montoya's Williams by a fraction (passing just in front of the startled Colombian) and went smashing into the side of Sato's Jordan. If ever there was evidence that the side-impact tests are needed for F1 cars here it was. The impact was one of colossal force. The two cars ended up in the sand trap and there was widespread relief when Sato was seen to move. But then he stayed in the car and the medical teams arrived. The problem was that the Sauber smashed through the Jordan monocoque in the area of the Japanese driver's lower legs and the damage made it difficult for Sato to get out. He was bruised and fairly shaken but in one piece. Eventually he stretchered to an ambulance and taken to the medical center and from there he was flown by helicopter to a hospital in Graz for tests. But if it looked like a disastrous day for Jordan and Honda it also ended up as a good day because by the end of the race Giancarlo Fisichella was in fifth place, fighting off David Coulthard's McLaren-Mercedes and Jenson Button's Renault. Jacques Villeneuve would have been there too but he went out on the last lap with an engine failure which dropped him from eighth to 10th, behind the two Toyotas. So Jordan went away with two points and now only BAR has yet to score this year. The points move the team up to eighth in the Constructors' title (ahead of Toyota) so there was something for the Honda men to smile about after months of pain. It was a very average day for Renault with Trulli going out with an engine problem and Button seventh. The Arrows team had a miserable day with Enrique Bernoldi running into Frentzen at the first corner and then Villeneuve knocking Heinz-Harald off at the second. Bernoldi went out with a suspension problem later on. Frentzen recovered but spent the afternoon dicing with Minardis, which must have been depressing. Still it was better than Jaguar which failed to get a car home again. In the days ahead there will, no doubt, be much debate about what happened but there are no answers and no solutions. Ferrari won a good victory but then created a public relations disaster. A few weeks from now will it matter? Will millions turn off their TV sets in the future or will more turn on to see what the fuss is all about? "It would have been easier to change the pit stops around," said Ross Brawn in justification. "It would have been easier to have done other things to make it less obvious. To have it done it in a clandestine way would have taken credit away from Rubens. We could try to hide behind the way we approached it - but we didn't."